Dihydrotestosterone (DHT), a derivative of the male hormone testosterone, is the enemy of hair follicles on your head. Simply put, under certain conditions DHT wants those follicles dead. What basically occurs is that a certain enzyme that is held in the oil glands of hair follicles, called Type II 5-alpha reductase, converts Testosterone, (which yes can be found in women too), into DHT. Once the DHT is formed, it binds onto to the receptors in scalp follicles, shrinking the follicles and making it almost impossible for healthy hair to survive. 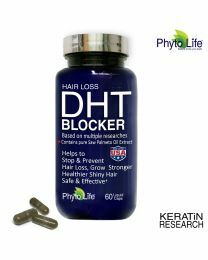 Successfully Blocking DHT at this point may prevent any further hair loss. “Feeding” the weak and dormant hair follicles will make them re-grow stronger healthier hair. You can try to stop hair loss with drugs or supplements. 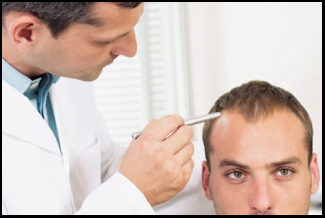 Using drugs like Minoxidil and Finasteride can cause irreversible serious side effects. 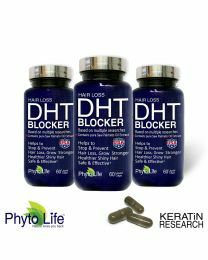 On the other hand Hair Loss DHT BLOCKER™ is a proprietary formulation of Natural Supplement that can only help you. ♦ Hair Growth & Restoration Vitamins. 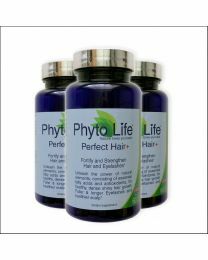 ♦ Provides Essential Nutrients to the Hair Follicles. 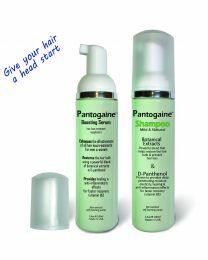 ♦ Immune function Boosters to stimulate hair growth. ♦ B vitamins to reduce the impact of stressors. ♦ Improves Blood circulation & flow in the scalp area. ♦ ♦ Contains Pure Saw Palmetto Oil Extract: Saw Palmetto is an herb that is well known to inhibit DHT. It’s natural habitat is the Southeastern region of the United States, most commonly in Florida, which is where we retrieve our Saw Palmetto Extract directly from Valensa® Manufacturing site. specializes in the manufacturing of Saw Palmetto, promoting themselves as the Gold Standard of this product. Valensa® works directly on-site with the farmers of Northern Florida in their process of obtaining the extract of this mighty little herb. By using the freshest and purest Saw Palmetto we are providing you with only the finest ingredients. Hair Loss DHT BLOCKER™ comes in a form of liquid capsule, One Capsule equals 4 to 6 tablets from other brands. Betta-Sitosterol- study shows a positive effect on male hair loss in combination with Saw Palmetto Oil Extract. Pumpkin Seed Oil ‐ Helps to regulate testosterone levels. Vitamin B3- improves circulation including blood flow in the scalp vitamin-B3 along with Biotin offers a powerful combination of hair loss supplements restoring hair growth both in men and women. Kudzo Root ‐ Chinese herb, the second‐richest plant source of isoflavenones Some research suggests a positive effect on blood flow and microcirculation. Fo‐ti Root‐ Popular Chinese herb traditionally used for many reasons, including to darken pre‐mature gray hair, hair darkening, hair thickening and hair regrowth. Zinc- Enhances immune function, which can stimulate hair growth. Vitamin B-12- Reduces the impact of stressors on the hair follicles. Folate- Help reduce the impact of stressors on the hair follicles. PABA ‐ May restore graying hair to its original color. Manganese ‐ Essential to proper hair growth; deficiency is associated with hair loss. Pygeum africanum- Inhibits 5 alpha reductase when given with Nettle.